For the past twenty years, eCommerce has been an incredible tool for companies to scale the sales of their standard products. Net retail eCommerce sales have reached $2 trillions in 2016, a number that is expected to double by 2020 . However, only recently have some companies started disrupting the traditional retail industry by addressing individual customers’ needs through their eCommerce platform. The ability to provide a scalable sales platform for custom products is called mass customization, and it essentially comes with two necessary elements: on the one hand, a product configuration interface for the customer and on the other hand a production and supply chain adapted to custom products. One doesn’t go without the other: without a product configurator, a company can’t present their products online exhaustively. On the other hand, on can’t be price competitive without a streamlined manufacturing or supply process, with or without the right customer interface. The following companies are all tackling mass customization by focusing on their online user experience through high-end product configurators. Bikes are a highly modular product that is naturally fit for mass customization. Configuring a bike amounts to picking individual parts and putting them together. Developed by Elementals Studio, Bikeconfig is an online 3D bike configurator allowing users to put together bikes from scratch using a database of existing parts by many different producers. Any bike shop can connect the configurator to the specific parts they sell and show their customers exactly what they can build for them. Shoes of Prey’s website lets you play and personalize beautifully rendered shoes through a sleek interface that exploits the full potential of the 3d technology. Tylko need little introduction in the field of mass customization. In a few years, the Polish startup carved a name for itself with its customizable shelf system. At the center of the Tylko experience lies a complete and flexible 3D configurator offering virtually endless options for shelves tailored to any living space. “The result is a product created by the designer yet adapted to the specific needs of the customer” says co-founder Mikolaj Molenda . Unlike configuring a bike or a pair of shoes, the size of each board of the tylko shelves is defined by the customer. This results in a unique set of plywood boards that need to be manufactured to these precise dimensions. As a consequence, the manufacturing process needs to accomodate the needs of customization (but this is a topic for another article). If you have any doubts regarding the future of mass customization, inverstors seem to disagree: the company just raised $3 million to develop their technology further and expand their range of products. Escaping the fields of architecture and generative design, parametric modelling is making its way to product design, offering far more to configure than sizes and colors. An early example is form.bar, a fully parametric shelves system. Form.bar uncovers the true power of parametric design: parameters are not merely functional, they actually allow each customer to become a part of the design and imprint it with their own style. Since the advent of 3D printing, generative design also made its way to jewelry, bringing its fascination for natural phenomena. Cell Cycle is a jewelry configurator inspired by microscopic cellular structures, by the design studio nervous system. Me-Do is the new innovation project developed jointly by Arauco (Chile) and Alpi (Italy), two specialists in wood manufacturing and processing. 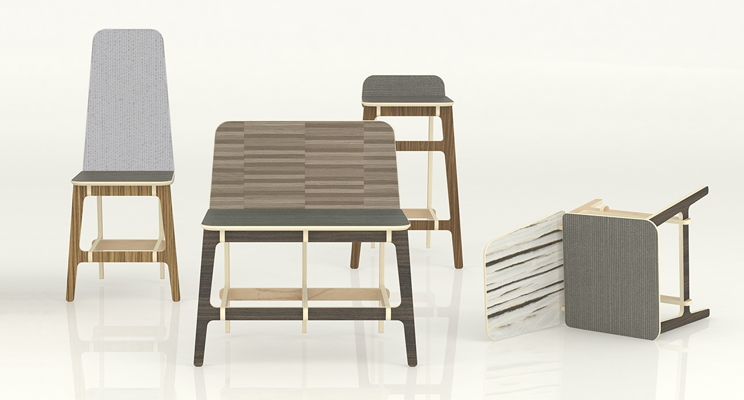 Me-do brings mass customization to high-end design. Not only can me-do pieces be customized up to the centimeter, but users can pick from a wide variety of veneering patterns to dress up their favorite chair, table or shelves. Given the high level of complexity and the variety of designs, in-house development was out of the question for the company. ShapeDiver helped bring the project to life, from the online 3D configurator to the export of CNC data, ready for manufacturing. Visit our B2B page and get in touch if you need help for your project!